International Press Institute (IPI) Executive Board Vice Chair Beata Balogová, the editor-in-chief of leading Slovak daily newspaper SME, spoke to a crowd of thousands on February 21 in Bratislava at a demonstration calling for justice one year after the murder of journalist Ján Kuciak and his fiancée, Martina Kušnírová. Balogová read a statement signed by over 400 Slovak journalists vowing not to stop searching for the truth. She was joined on stage by Denník N Editor Matúš Kostolný and other leading Slovak journalists as well as IPI Deputy Director Scott Griffen. 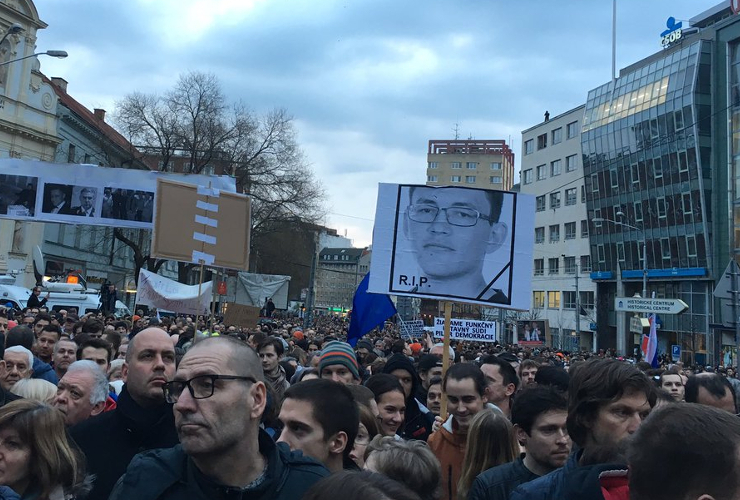 Organizers estimated that up to 30,000 people attended the Bratislava protest, while other gatherings took place across Slovakia. Kuciak and Kušnírová were gunned down on February 21, 2018, in their home in Veľká Mača, west of Bratislava, Slovakia. Kuciak, an investigative journalist with the news website Aktuality.sk, had been covering high-level corruption cases, including alleged links between organized crime and top Slovak politicians. The killing triggered an upheaval in Slovak society, forcing out former Prime Minister Robert Fico, Interior Minister Robert Kaliňák and police chief Tibor Gaspar. Authorities have charged four individuals with carrying out the killing but have not publicly identified or charged a suspected mastermind. Earlier in the week, on February 19, IPI and the Committee to Protect Journalists (CPJ) met with the office of the special prosecutor investigating the Kuciak murder. Officials said their main aim was to “identify and prove guilty” the person or persons who ordered the crime and that they were “very close” to announcing who this was. IPI and CPJ also met with Interior Ministry officials to push for better protection of journalist safety more broadly. The groups urged the government to send a strong public signal of support for the investigation on the anniversary of the murder. On Thursday, Interior Minister Denisa Saková issued a statement on Facebook thanking the investigators for their work so far. On Wednesday, IPI hosted a press briefing in Vienna. Balogová and Griffen briefed an audience of Austrian and international journalists on the current status of the murder investigation. Balogová also discussed the impact of the murder on Slovak politics and society and contextualized it within the growing threat to media freedom in the Visegrád region of Hungary, Slovakia, the Czech Republic and Poland. If the murder is to bring any meaningful change to Slovakia, Balogová said, it must tackle harmful social and political power structures. “It’s not only important to point out who fired the gun, it’s not only important to say who ordered the murder, but also to investigate all the related crimes”, Balogová said. The murder investigation, she noted, has brought to light additional allegations of criminal activity by the suspected mastermind, controversial businessman Marián Kočner. “All these people who thought that simply by having connections to political elites, bribing police, and bribing prosecutors they can have protected status in the society” need to be revealed. “It must be made impossible for them to continue sponging on society any longer,” Balogova said. “The murder of #JanKuciak led to the some of the biggest political changes since the Velvet Revolution and brought together the journalistic community in #Slovakia, that finished most of his stories.” @BalogovaBeata über kleine Hoffnungsschimmer in einer tragischen Lage. 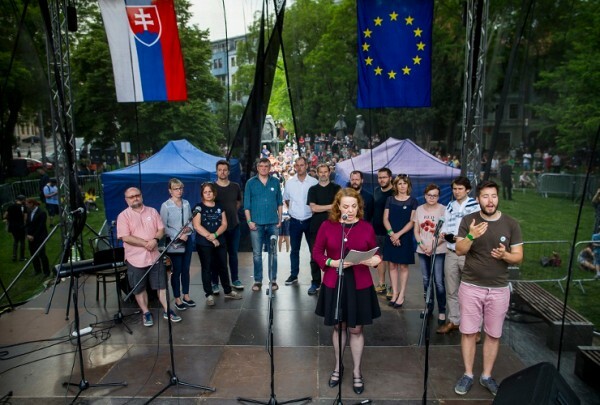 IPI has visited Slovakia on numerous occasions over the past year to campaign against impunity. Last October, IPI Executive Board Chair Markus Spillmann led an IPI delegation to meet with Slovak President Andrej Kiska, who offered strong support for ensuring that the masterminds behind the killing are brought to justice. On International Day to End Impunity, November 2, IPI’s 24-member global Executive Board carried out a solidarity visit to the memorial for Kuciak and Kušnírová in Bratislava. 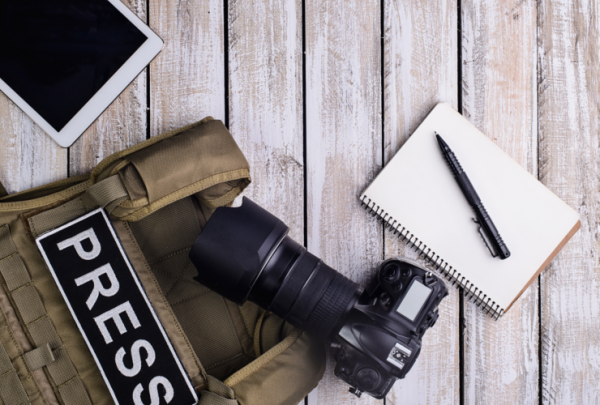 In December, IPI joined a press freedom visit to Slovakia organized in partnership with the Council of Europe’s Platform for the protection of journalism and the safety of journalists.